The design and coordination of policies to promote a more productive economy are challenging for all governments. But what is distinctively challenging in developing countries is policy enforcement, in particular against corrupt practices. This column outlines key policy measures for building more competitive firms in different economic sectors and concludes that anti-corruption strategies are critical instruments in addressing the central question of how to achieve ‘production transformation’. After several decades languishing near the bottom of national and global policy agendas, the goal of building more competitive and productive firms in different economic sectors – ‘production transformation’ – is back in vogue. Governments in developing countries, particular across Africa, are calling for a new wave of industrial policies aimed at increasing productivity in agriculture, developing new manufacturing sectors and capturing gains from global markets. Moving away from a poverty-focused narrative, in 2015 the Sustainable Development Goals recognized the importance of creating decent work and boosting innovation, industrial transformation and investments in infrastructure. As my colleague Ha-Joon Chang and I stress, the achievement of these goals is not simply the means to an end, such as more income per capita. They are integral parts and distinctive features of an inclusive and productive society, which is able to deal with the challenges of social, economic and environmental sustainability. Indeed, an economy with a high income per capita that results simply from a resource bonanza is structurally different from a productive and diversified economy where people are involved in value creation and distribution via meaningful jobs. Despite the emerging consensus around the importance of production transformation and some optimism about the opportunities offered by growing South-South trade and global value chains, developing countries face serious challenges. These become particularly evident when we move from discussing general policy goals, towards an analysis of how to achieve these policy targets in specific adverse contexts. The how issue is a three-piece puzzle: it involves combining the design of a policy; the coordination and alignment of policy packages; and crucially, the enforcement of the policy. The first piece of the puzzle is how to design a policy that is able to address the targeted problem in an effective way. In different contexts, different institutions go about designing policy in different ways. For example, if the goal is improving skills among young people for productive employment, this could involve vocational training systems, as well as delivery mechanisms such as on-the-job training, apprenticeships and internships. To make things more difficult, each productive sector requires different types of skills, so training must match skills requirements. Another example is power generation, which many developing countries find challenging. Here the policy design needs to recognize different electricity needs and the different institutional and policy answers they require to be met. For example, while the popular off-grid solar panel solutions might be an effective policy solution for household needs, power for productive uses might not work in the same way. A cement factory will require more traditional sources of electricity. Each of these solutions to different needs will also have to be funded. Production transformation is about managing interdependencies, this is why policies are effective only to the extent that they are coordinated with other instruments – the second piece of our puzzle (for which I have developed a policy matrix to help navigate the issue). For example, the implementation of skills development policies needs to go hand in hand with the promotion of firms’ development, productivity increases at the shop-floor level and technology absorption. Otherwise, skilled workers will remain unemployed or deployed in unproductive organizations with low salaries and limited scope for learning and social mobility. Policy design and coordination are challenging in all countries. What is distinctively challenging in developing countries is enforcement of the policy, in particular against corrupt practices – our third and final puzzle piece. All policies imply the risk of corruption – for example, a certain monetary incentive given to firms to co-develop skills, a subsidy in the electricity price to overcome investment risks or a licence to extract some natural resources – all of which can be captured by different organizations and diverted from productive uses. Given that all sectors present different degrees and types of vulnerability to corruption, anti-corruption strategies will be effective only to the extent that they operate sector by sector. Strategies to deal with the corruption and enforcement element of productive transformation policy design are the focus of the SOAS Anti-Corruption Evidence (ACE) Research Consortium. SOAS-ACE is working in three countries – Bangladesh, Nigeria and Tanzania – and in each we have identified different sectors where feasible anti-corruption interventions will potentially have a big impact on development. As an illustration, Figure 1 shows the sectors identified in Tanzania. The sector-specific anti-corruption strategies that we are investigating build on different design principles that make the policies more enforceable. In a nutshell, the more organizations in specific sectors are offered ways to deliver development outcomes that are in their own interests, the more policies will become enforceable. Importantly, this approach recognizes the need to align incentives among different organizations, (for example, firms and vocational training providers); to provide different solutions for different types of organizations (such as small and large firms); but also to build coalitions and promote new ways to resolve rights disputes such as in the case of the land sector. 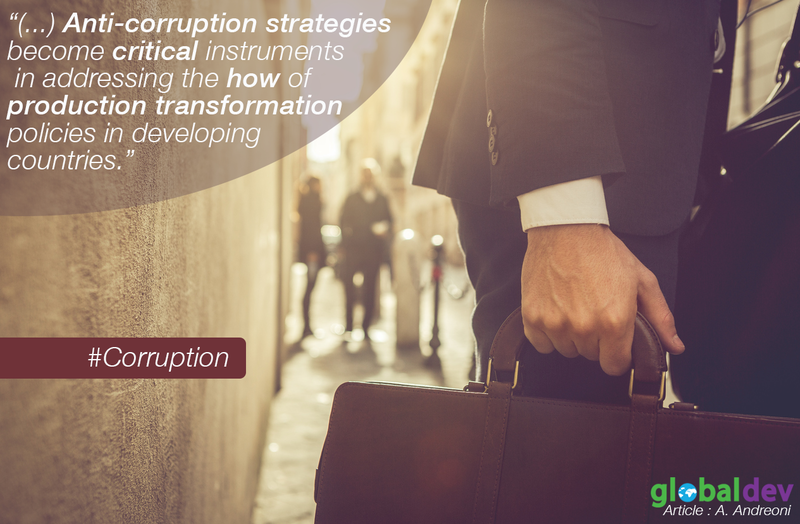 Along these lines, anti-corruption strategies become critical instruments in addressing the how of production transformation policies in developing countries. Antonio Andreoni (PhD Cambridge) is Senior Lecturer in Economics at SOAS University of London and Research Director of the Anti-Corruption Evidence (ACE) Research Consortium (DFID).